This transformational journey in words and pictures chronicles Nancy Calef's evolution from child model, suffering anorexia and bulimia, through recovery and maturation into a multi-disciplined artist re- nowned for her innovative "Peoplescapes:" vibrant plein-air colors applied to exaggerated snapshots of the human condition. Characters are often rendered in 3D, sculpted on the canvas, found objects, symbolism and commentary added, together producing a remarkable narrative on issues facing society. Driven by honest self-examination and daily commitment to convert her self-destructive energy into creative expression and physical exercise, Calef provides in these pages a path for other young people to help themselves transcend their deepest emotional and physical obstructions. More than a cocktail table art book, Peoplescapes -- My Story From Purging To Painting is an around-the-world tale of self-discovery, courage, and love, at turns hilarious and heart-breaking, while Calef's luminous talent shines through. 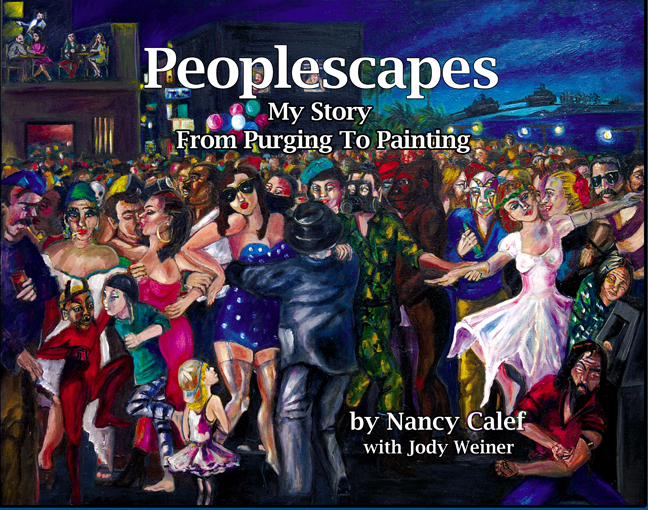 Calef, Nancy with Weiner, Jody Peoplescapes - My Story From Purging To Painting/ Nancy Calef with Jody Weiner. 1st ed. with all its sad happy faces." you know who is struggling with self-esteem." self-absorbed or self-aggrandizing. It’s frank, funny and fascinating." "Your excellent book is quite a tour de force! Your description of maternal abuse is moving and disquieting, while your introspection, honesty, and successful efforts to rid yourself of your eating disorders will inspire others to follow your lead. I really `couldn't put the book down,' and your art is amazingly creative and unique. All in all, I stand back and applaud. Congratulations on a beautifully written and illustrated work of art." "I enjoyed Peoplescapes. I absolutely love Nancy’s artwork. She’s clearly a talented contemporary artist. . . . Nancy Calef is proof that we can all overcome life’s difficulties and turn negative experiences into positive creativity. I would recommend this book to anyone who enjoys reading about triumph over adversity, and finding one’s own creative path and purpose." "Nancy has taken a unique view on sharing her story through her gift of artwork and sharing how the arts can be extremely helpful and therapeutic with recovering from an eating disorder." "Nancy Calef has distinguished herself as a role model for this generation. In a world where girls and young women are confronted with idealized images, Nancy, sharing her inner life, demonstrates that a mind in creative process can prevail in the face of childhood pain"